The parakeet auklet (Aethia psittacula) is a small seabird of the North Pacific. Parakeet Auklets used to be placed on its own in the genus Cyclorrhynchus (Kaup, 1829) but recent morphological and genetic evidence suggest it should be placed in the genus Aethia, making them closely related to crested auklets and least auklets. It is associated with the boreal waters of Alaska, Kamchatka and Siberia. It breeds on the cliffs, slopes and boulder fields of offshore islands, generally moving south during the winter. 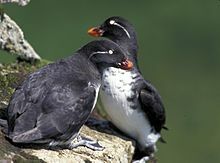 The parakeet auklet is a highly vocal species at the nest, calling once it arrives at the nest and then duetting once its mate arrives. It makes a series of rhythmic hoarse calls (like that of the Cassin's auklet) and a quavering squeal. The function of these are unknown, but could be associated with defending its burrow from intruders and strengthening the bond with its mate. The parakeet auklet is highly social in its breeding colonies. ^ BirdLife International (2012). "Aethia psittacula". IUCN Red List of Threatened Species. Version 2013.2. International Union for Conservation of Nature. Retrieved 26 November 2013. ^ Gaston, A.J. and Jones, I.L. 1998. The Auks: Alcidae. Bird Families of the World. Oxford University Press, 349pp. Collinson, Martin. 2006. Splitting headaches? Recent taxonomic changes affecting the British and Western Palaearctic lists British Birds 99: 306-323. "Aethia psittacula". Integrated Taxonomic Information System. Retrieved 24 February 2009. This page was last edited on 17 April 2019, at 10:43 (UTC).